Many homeowners have had the unfortunate task of having to replace their water heater when they weren’t planning to do so. As with any unplanned home appliance replacement, there isn't much time for research when it’s your hot water. With that in mind, we at Hometown Plumbing would like to give an unbiased rundown of the most common residential water heater options available. Typically, in a residential application, there are five different types of water heaters you may have in your home; standard electric, standard gas, direct-vent gas, power-vent gas, and tankless. We will go through each of these and give some basic differences to aid in your decision making should you find yourself needing a new water heater. The first water heater we will discuss is the standard electric water heater. This heater runs off of 240V AC and will have no vent at the top of the unit. They will have two removable panels on the side of the unit held on by screws. These panels allow access to thermostats for adjustment and replacement. The typical energy factor of a standard electric water heater is around 92%. When comparing this rating to a gas water heater, it can be a bit misleading simply because the method of heating water is different. Electric water heaters have significantly higher energy factor ratings than gas tank water heaters, but to compare the two solely on this rating is not an accurate comparison criteria. While electric water heaters have a 92% energy factor, the annual energy cost to heat your water is around $300. As opposed to $150 with a gas water heater. The second type of water heater we will discuss is a standard gas water heater. This type of water heater is what the majority of homes will have in the northern suburbs of Atlanta. Most commonly they come in 40 or 50-gallon sizes. They will have a gas line connected to the water heater at the bottom of the unit and they will have a 3” or 4” metallic vent pipe at the top extending through the roof or to a connection with your furnace vent. The most common type of vent on a gas water heater is an atmospheric vent, but there are other types that we will discuss next. The typical energy factor of a gas water heater is around 60%, but as discussed earlier this is not an accurate comparison point with an electric water heater. The third type of water heater to compare is also gas but has a different type of venting. A direct-vent gas water heater will have a metallic vent that comes off of the top of the water heater into a 90-degree elbow and immediately out of the side of your house. This heater will have a similar energy factor rating as the atmospheric vent heater but will cost approximately three times that of an atmospheric vent unit. The last type of tank water heater discussed is also gas, but again has a different type of venting. The power vent water heater will have a blower fan at the type with PVC piping for the vent and will usually run long distances before exiting your house. Again, energy factor rating is similar to atmospheric, but cost is 4-5 times more. Also, this unit will use 120v power to run the blower fan which will add to the operating costs. Although it may be hard to understand why a builder installs one type of water heater and not another, in most cases, you will have to replace it with the same type. The only exception is if you choose to install the last type of water heater we will compare, the tankless water heater. As I said before, I will attempt to be as unbiased as possible while comparing. In this blog, we will only discuss gas tankless water heaters. Tankless water heaters have grown significantly in popularity over the last decade, but there are still many skeptics that aren’t buying the hype. As with the energy factor comparison between gas and electric, comparing tank-type to tankless isn’t truly an accurate comparison because they are so different from each other. 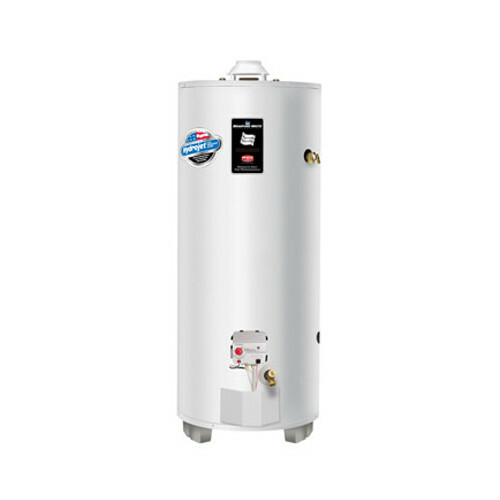 Tank water heaters have a reserve of hot water waiting to be used; the burner will come on periodically throughout the day to ensure the water in the tank is at the desired temperature. Once you begin to use your hot water, that reserve is depleted until either you stop using it or you use it all. As you use the hot water, the burner will come on and attempt to reheat the water as you use it. It is impossible for a standard tank type water heater to keep up with the demand as it is depleted though. Once your hot water is gone, you have to wait for the water in the tank to be reheated, which could take up to 45 minutes to an hour. With tankless water heaters, there is no reserve. Instead, water passes through heat exchangers that heat the water as you use it. This is similar to the heat exchanger in your furnace that air passes through when you call for heat. Returning to energy factors, the typical energy factor of a tankless water heater will be 82% with a non condensing tankless and 95% with a condensing tankless. Although this is still not an accurate comparison with electric tank water heaters, it is an accurate comparison with gas tank water heaters. The expected annual cost to operate a tankless water heater is $50-$100. The cost of a tankless water heater is similar to that of the power vent water heater, but installation can vary. The typical life expectancy of a tankless water heater is 20-25 years, compared to 8-10 years with tank water heaters. As you can see, there are definite differences in water heater options, but one thing that’s the same no matter which option you need/want is that Hometown Plumbing can help you with any. We can also help with discussing the options more in-depth to help you make the best decision for your situation. Call us anytime (678) 598-6528.